With all that it can offer tourists, from food to culture to scenic spots, Taiwan is an ideal travel destination for Filipinos. “We would like to foster stronger ties with our southern neighboring countries, of which the Philippines is the closest,” she added. The northern tip of the Philippines and the southernmost part of Taiwan are only 250 kilometers apart, she pointed out, adding that the Ivatans of Batanes and an indigenous group in Kaohsiung, Taiwan even share the same language. According to her, aside from top ratings in safety, security, and civil liberties, the well-being of Taiwan citizens is comparatively high when measured against the indicators used by the OECD Better Life Index. AIRASIA CEBU-TAIPEI ROUTE. Philippines AirAsia chief executive officer Dexter Comendador (3rd from right) leads the launch of the Cebu-Taipei route that will start operating thrice weekly on November 25. With him are Taiwan Economic Cultural Office director for press division Jerry Cheng-An Chuang (4th from left), Department of Tourism head for route development Erwin Balane, and Captain Gisela Bendong-Boniel (4th from right), who is also the mayor of Bien Unido town in Bohol. Taiwan’s favorable climate and geographic location result in a bounty of fresh produce and seafood all year round. The people of Taiwan know their food, and have formed a dining culture that is uniquely Taiwanese through the merging of eastern and western elements in their dishes. To truly experience Taiwanese life, visit the night market and try these local delicacies: stinky tofu, pig blood cake, oyster omelets, stewed pork rice, spicy duck blood, squid thick soup, and pepper buns. Other scrumptious fare include the Taiwanese stewed beef noodle soup and the world famous xialongbao (steamed soup dumpling). Taiwan is also known as a tea paradise so don’t forget to indulge in such popular flavors as Wenshan Pouchong, Tung-ting Oolong, Tieguanyin, Hakka ground tea, and pearl milk tea. CNN, Ramirez said, named Taiwan as world’s best food destination in 2015. Taiwan is a haven for shopaholics, with its latest international fashion and luxury brands, boutique goods, premium quality local artisanal products, large-scale commercial districts, and internationally renowned night markets. A growing creative and cultural industry in Taiwan has given rise to unique products crafted by dynamic local artists. Enjoy a wide range of local crafts at Taipei’s Dihua Street, Ximen’s Red House, Huashan 1914 Creative Park and Songshan Cultural and Creative Park as well as Kaohsiung’s Pier-2 Art Center. Great bargains may be grabbed at Taipei’s Ximending, Wufenpu or the commercial district behind Taipei Main Station, Taichung’s Yizhong Street and Fengjia Night Market, and Kaohsiung’s Sanduo Commercial District and Dream Mall. FLY TO TAIPEI. AirAsia will fly 3 times a week to Taipei from Cebu starting on November 25. Taiwan’s high mountains and complex geological formations make for a diverse scenery that is sure to excite any nature lover. Its well-known peak Yushan or Mt. Jade rises 3,952 meters and is considered to be the the tallest mountain in Northeast Asia. The Taiwanese are also blessed with spectacular landforms that range from sandy beaches, lagoons, and sandbars in the southwest coast; rocky shores, deep slopes, and narrow plains in the east coast; rocky headlands in the north coast; and coral reefs in the south coast. Its rich wildlife resources makes it a natural paradise for butterfly and bird watchers. Don’t forget to check out any or all of Taiwan’s eight national parks, each with their own distinct characteristic: among them the griotte formations and gorges at Takoro National Park, volcanic landforms in Taipei’s Yanming-Shan National Park, endemic fish species at Shei-pa National Park, ridges and peaks in Yushan National Park. Nevertheless, added Ramirez, Taiwan has a modern and efficient public transportation system, allowing travelers to easily move across its many beautiful destinations. Its two biggest cities, Taipei and Kaohsiung, have mass rapid transport systems. The high speed rail is complemented by local trains, buses, and taxis. Taiwan boasts of a diverse mix of culture from a long list of inhabitants that has contributed to its unique local flavor. Its 5,000 years of Chinese civilization can be relived through the National Palace Museum in Taipei, which hosts a staggering 650,000 artifacts from this chapter in its history. Major cities are filled with ancient forts, temples, and preserved old streets and structures. Heritage structures worth a visit include the formerly prosperous commercial districts of Taipei’s Dihua Street and Wanhua District as well as Taichung’s Lukang and Tainan’s Anping. The Longshan Temple goes back 270 years while Lukang features well preserved old streets and buildings. There are folk festivals and activities all throughout the year in Taiwan. Major events include the releasing of sky lanterns over Pingxi in New Taipei City and fireworks display in the Yanshui Beehive Rocket Festival in Tainan. MORE ROUTES OUT OF CEBU. Philippines AirAsia chief executive officer Dexter Comendador (center) says AirAsia will open more routes out of Cebu in the coming months. With him during the press conference are Taiwan Economic Cultural Office director for press division Jerry Cheng-An Chuang (left) and Department of Tourism head for route development Erwin Balane. 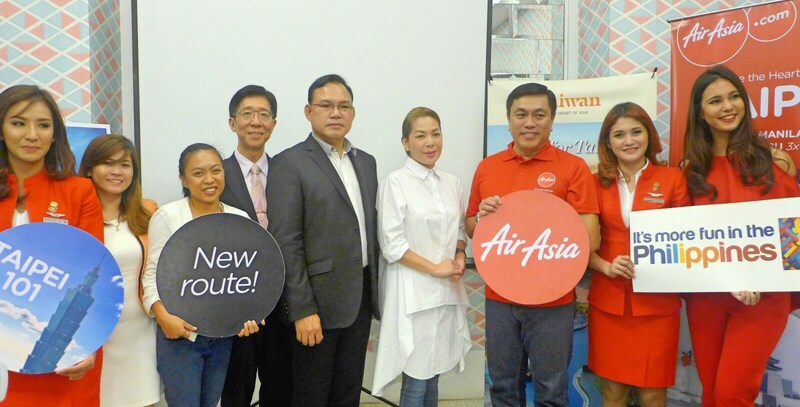 Aside from the Taipei flights that are scheduled to start in November, AirAsia plans to open more international routes out of Cebu in line with its plan to turn the island into a major hub of operations, said Philippines AirAsia chief executive officer Dexter Comendador. The airline company’s vision to bring the millions of tourists going around Asia to the Philippines, he added. AirAsia also recently announced the opening of flights to Singapore out of Cebu. “AirAsia feels strongly about the development of cities outside of Metro Manila. It is pushing for tourism growth and promoting the Philippines across the ASEAN region,” he added. To celebrate the new routes, AirAsia offered promo fares starting at P888 at airasia.com for flights to Taipei and Singapore out of Cebu.